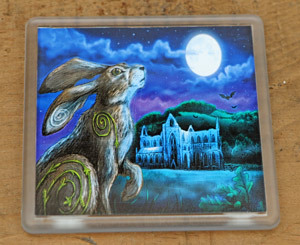 “Pentre Ifan Hare Plaque” by Kathleen Minton. the site of the blue stones of Stonehenge. an important site to our ancestors. thought what a lovely sculpture it would make. Made from marble mixture, so fully weather proof. Be the first to review “Mystical Wall Plaque Collection: Pentre Ifan Hare Wall Plaque” Click here to cancel reply.